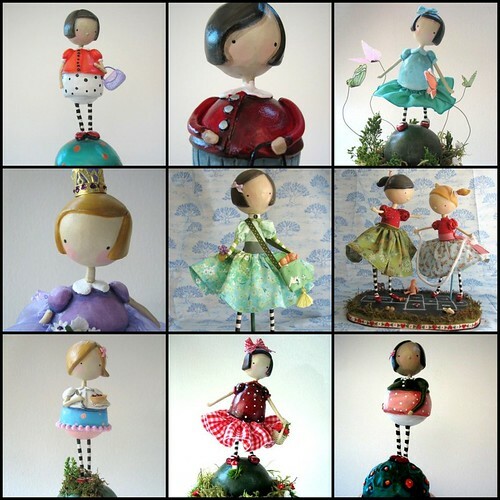 Never in all my searches and escapades around Etsy, the oh so world wide web, and local shops have I found such perfect, danty and beautiful dolls as I have found in Eleven Mornings shop. Her color choices are combinations are divine. The round bellies and thin legs make me smile. All of the small and delicate details are proof of the fine craftsmanship. I am in love with the little ladies of Eleven Morning. Some day I will have my own lovely. Someday. i absolutely agree with you that these dolls are great! Your blog has been a good read too. Wow! These are really gorgeous! What a find these dolls are. You have a great blog. those dolls are DARLING! great post! thanks for leaving a comment on my new blog: jensvintage.blogspot.com! You were my first! Those are the cutest little dolls ever! These dolls are just wonderful, aren’t they? !